Sponsored content includes content that is demarcated as “sponsored by,” “brought to you by,” or “presented by” – as in the soap opera days of old. These may be stories written either by a media publication or blog or by the brand. 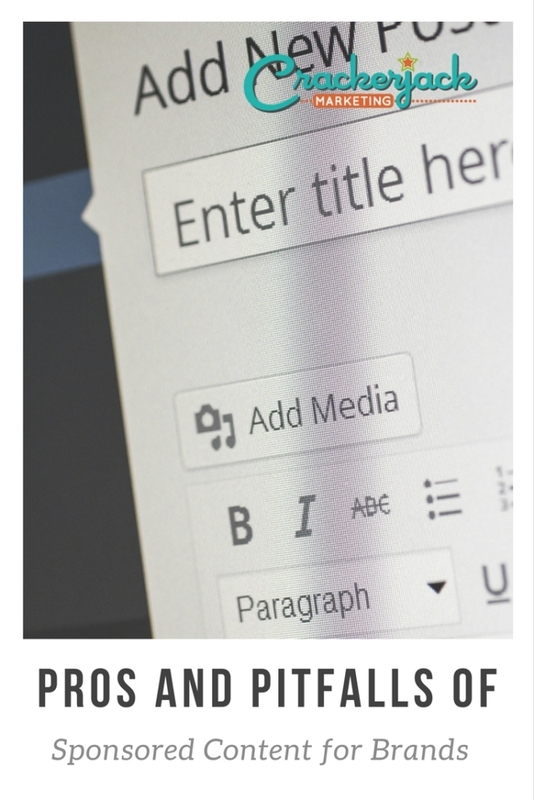 Sponsored content may also be eBooks, whitepapers, videos or infographics made available on a publisher’s site. Native advertising, a slightly narrower universe of sponsored content, typically fits only within the site or platform its on. Facebook sponsored stories, for example, can only be found on Facebook. An article sponsored on a media publication, written by and for that publication and only run in that one place, could also be considered native advertising. Sponsored content looks a lot different than ads did in the past. Because sponsored content look more like the standard content of the site they’re on, more consumers pay attention to them. This can translate into greater brand awareness, more consumer-to-consumer sharing, and ultimately, more sales. The advantage of sponsoring or publishing native content is that brands can often reach larger audiences through the publications they choose, vs. through their own sites or social channels. 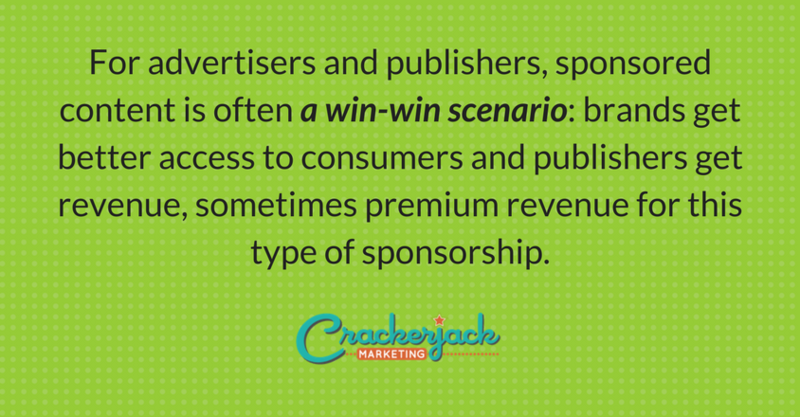 For advertisers and publishers, sponsored content is often a win-win scenario: brands get better access to consumers and publishers get revenue, sometimes premium revenue for this type of sponsorship. 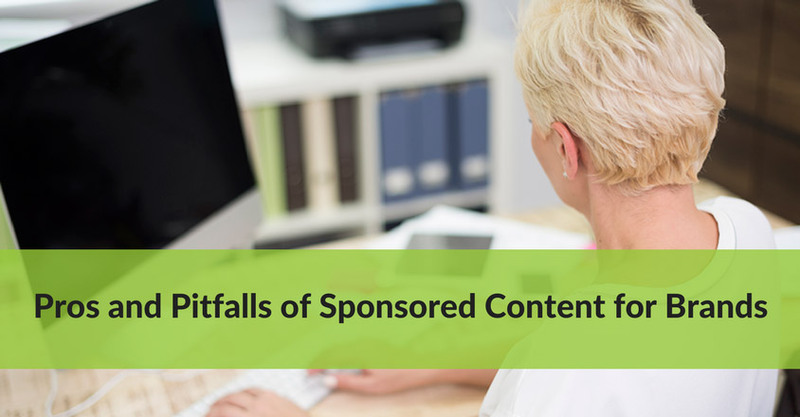 One of the main concerns about sponsored content is that it be deceiving. Often, sponsored content resembles news content, which causes many, especially those in journalism, to question the ethics involved in posting it. In fact, some go as far as to call this type of content corporate propaganda, while others argue that the articles provide valuable information that addresses important issues and offers real value to readers. Many publications do put effort into ensuring that this type of content is separate from the news they provide. However, that separation isn’t always enough to ensure that consumers can easily distinguish between news and sponsored content. In some cases, publications position editorial and advertorial content side by side or on pages practically identical to those used for news content. Despite the fact that sponsored content is typically marked as such, many opponents of this type of advertising argue that the “Sponsored by,” Supported by,” “Paid for by,” “Partner of” wording is just not enough to help consumers tell the difference between news and ads. In their eyes, brands are taking advantage of consumer naivety to get their ads ranked and shared just like true news articles. Not surprisingly, Google doesn’t like that. The search giant has taken a strong stance against mixing sponsored content in with news. Google warns publications to keep the advertorials out of Google News and sets consequences for those that fail to heed the warning. If a business site mixes sponsored content in with the news, its entire publication may end up excluded. If Google sets an example with a few publishers, it could lead other publishers to minimize sponsored content opportunities. The Huffington Post is launching new sections sponsored by brands and featuring real-time stories created by the brands and the publication’s team. BuzzFeed helps advertisers reach consumers with quirky articles, such as 10 Lifechanging Ways to Make Your Day More Efficient (sponsored by General Electric). Forbes features articles written by employees of FedEx. The articles focus on issues common in business. Mashable publishes articles about technology that are sponsored by Snapdragon. Halfway through 2013, I’m going to make the prediction that we’re going to see more and more about sponsored content and native advertising in 2013, and it will truly explode in 2014. Do you agree? I’d love to hear your opinion in the comments.